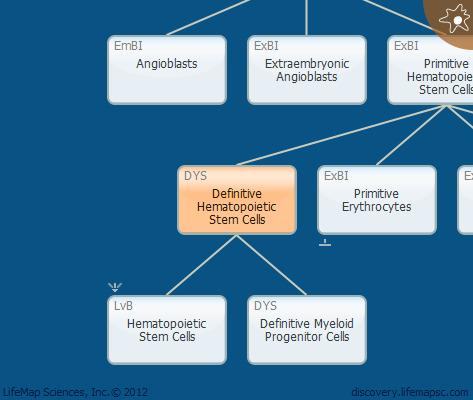 Definitive hematopoietic stem cells (HSCs) function as a source for the definitive hematopoietic cells of the yolk sac. These cells migrate to the fetal liver, where they mature. There is still a great deal of controversy and discussion about the contribution of yolk sac HSCs to blood production in the fetus and adult. Recent studies have implied that the HSCs of the yolk sac generate the definitive HSCs of fetal liver and bone marrow. In addition, debates are still ongoing regarding the identity of the progenitor of definitive HSCs and whether it is identical to that of primitive HSCs. KDR+/TAL+/RUNX1+ cells are definitive precursor cells for definitive hematopoiesis in the aorta-gonad-mesonephros and yolk sac.